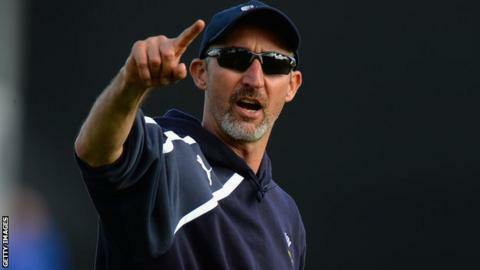 Jason Gillespie would take the England head coach job if offered by the England and Wales Cricket Board. The Yorkshire coach, 40, has been impressed by Andrew Strauss, England's new director of cricket, after positive face-to-face meetings this week. Australian Gillespie said on Friday he was one of several candidates in the frame for the position vacated by Peter Moores's sacking on 9 May. England caretaker coach Paul Farbrace has also declared his interest. However, the ECB has not yet offered the job to anyone. "Strauss and Gillespie met on Monday in Leeds and again on Thursday in London. They got on well and found a lot of common ground in a bid to resurrect the fortunes of the England team. "Strauss explained that there were other candidates and he had to go through a proper process. As yet there has not been a firm offer to Gillespie, who loves his job at Yorkshire, where he has had considerable success. But he is ambitious and loves a challenge." Former Australia fast bowler Gillespie led Yorkshire from Division Two to the 2014 County Championship title within three years and previously said he would "take persuading" to leave his current job. Gillespie is with the White Rose county for their four-day Championship game at Somerset, which begins on Sunday. England's second Test against New Zealand starts on Friday at Headingley - Yorkshire's home ground. The timing of both matches suggest the process of appointing a successor to Moores could last until the conclusion of England's two-Test series against the Black Caps, for which Farbrace has been put in charge. Speaking to the BBC's Test Match Special on Thursday, former England captain Strauss said he would like the new coach to be in place for the Ashes series, which begins on 8 July, but he was willing to wait for the right man. "There is a ticking clock ahead of the Ashes, but we won't rush it," said Strauss. "In an ideal world we'll have someone in place before that, but not if it's not the right man." The following day Gillespie, who took 259 wickets in 71 Tests for Australia, said he had a "good chat" with Strauss, but was only one of a number of candidates. "They made it very clear they're chatting to a number of people of interest, so they'll let us know what the process is in due course," he said. What do the pundits think? Former England opening batsman Geoffrey Boycott said: "If you get him, he's a top man. Good luck to him because he's not going to the best employers in the world, with the way they've treated Peter Moores and Kevin Pietersen." Ex-England captain Michael Vaughan, speaking on TMS from Lord's, said "cricket badger" Gillespie has been a "total breath of fresh air" at Yorkshire and likes to be "in the thick of it" with his players. "England are away from home 227 days this year and the coach is right there with them," Vaughan said. "Cricket coaching is different to football, where you may need that distance. "He'll admit himself he is a proper cricket geek. He is up on all the tournaments and competitions and he knows all the players' numbers. He is a cricket badger. "In selection, if English cricket thinks it will be the same with Gillespie in charge they need to think again. He will want it his way. He will want a big impact on where the team are going in all three formats. He keeps it simple and expects simplicity in terms of players. It might be an eye-opener for some players that he expects them to make decisions. "It doesn't surprise me he would take it. I suspect the offer will come." Fellow former England skipper Alec Stewart said he saw nothing in Gillespie as a player that made him think he was going to be a coach. But he believes the Australian will "keep things simple", allow players to make their own decisions on the pitch and will turn England "back into a team from individuals". He added: "He mustn't change because England are going to sign him up for what he is. I don't what the ECB remoulding him. "At times you will have to dictate to the team, but it's so important to give players the confidence to make mistakes. "The Ashes is so important. Why not give it to Gillespie for the Headingley Test match, so that come the start of the Ashes they can have him in there and just move forward?"